Synopsis: Against all odds, Katniss Everdeen has survived the Hunger Games twice. But now that she's made it out of the bloody arena alive, she's still not safe. The Capitol is angry. The Capitol wants revenge... The thrilling final instalment of this ground-breaking trilogy promises to be one of the most talked-about books of the year. With District 13 now at the forefront of a full-scale rebellion in Panem, President Snow and the Capitol are retalliating. Katniss is at the forefront- her face the catalyst, her words the motivation people need. But she wants to do more. She wants to fight, to bring down President Snow and end this tyranny forever. The question is, what will replace the Capitol? 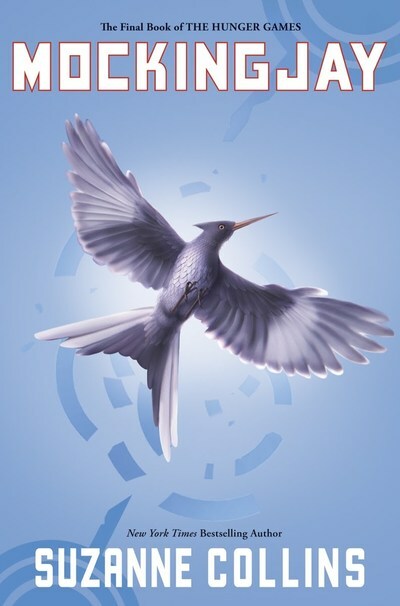 When Mockingjay was released in 2010, there was a huge buzz both on Twitter and the blogosphere. Having not read the trilogy, I watched as people were struggling to express what they felt about it: were they thrilled? Disappointed? Utterly confused? There’s no doubt about it that Mockingjay is a far more political novel than either The Hunger Games or Catching Fire, which were both predominantly action-based. This novel is charged with underlying messages and I couldn’t help but notice the similarities between Mockingjay and the Arab Springs of 2011 in which several Middle-Eastern countries revolted against dictators who had been in power for decades. With the rising sense of a rebellion at the end of the second book, Mockingjay could only go one way, and that’s a way I found inexplicably more interesting than the rehash of the first book in Catching Fire. Whilst writing Mockingjay, Suzanne Collins probably realised her mistake in using the first-person continuous tense whilst writing the trilogy. While it was perhaps suitable for The Hunger Games, it brings on a Katniss-fatigue in Catching Fire, and Mockingjay would benefit far more from multiple view points rather than just Katniss’. Whilst interesting, the first person point of view doesn’t do the rebellions justice and we don’t quite get a feel for the scale of the fighting. In terms of characters, Collins really buckles up. It is evident now that Katniss is no longer the girl she used to be, and her development as well as that of Prim and Gale (amongst others) really pushes the novel forwards. The changes we see in them are incredibly believable and really brings you closer to all of them. Without giving away too much, Peeta changes the dynamic of trilogy completely, turning it from the romantic-suspense novel it was in Catching Fire to a political tale where Katniss’ romantic choice is sidelined and very much unimportant. You could call The Hunger Games trilogy many things: a romance, a dystopian, or political thriller. One word that is now more powerful than any of those is “tragedy”, and this shows particularly well in the way that Mockingjay comes to a close. Whilst some people may feel cheated by the ending, it is in my opinion the most appropriate, sensitive, and true conclusion. It’s an ending where the outcome of the rebellion or the romance isn’t necessarily good or where the main characters haven’t necessarily become the opposite of their enemies. By the last fifty pages I was ready to break down into a sobbing mess in sympathy for Katniss and everything she’s had to go through, but it was only by the last chapter that my tears spilled onto the page. It may not be the happiest of endings, but it is one thing: the best ending it could have been. I wasn’t expecting something as good as Mockingjay. My hopes were that maybe, just maybe, it would be better than Catching Fire. 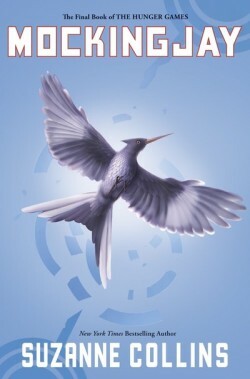 But Mockingjay isn’t just better than Catching Fire– it’s a lot better, and possibly my favourite book in the trilogy. It’s certainly different from the first two – it has to be – but different isn’t always bad, just as the same isn’t always good (as we saw with Catching Fire). I don’t think The Hunger Games could have ended in a better way, just be prepared with tissues once you come in for the home straight.